Go on experiment a little…Morgan’s Hop sachets and pure strain brewing yeast for creating your own individual brews. In conjunction with Australia premium Hop suppliers Morgan’s bring you a popular selection of hop pellets packed into the handy Morgans’ 12g “Tea Bag” style sachet. Each variety is pre packed into the handy infusion bag and ready for steeping in hot water. With Morgan’s finishing hops you can add a unique hop flavour and aroma creating your very own boutique beer. 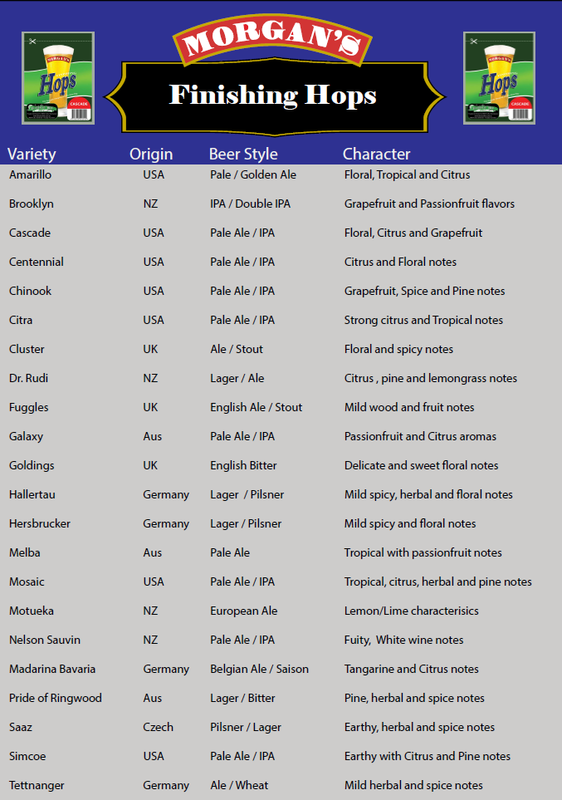 Not sure which Hop to use, check out our Hop Quick Reference Table. Traditionally used in: Pale Ales & IPA. Pleasant, floral and citrus and grapefruit; defines US Pale Ales. 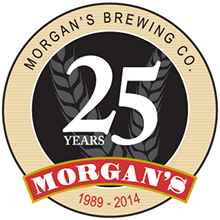 Traditionally used in: English style ales & Stouts. Robust aroma an excellent hop for dark beers, with mild wood and fruit notes. Traditionally used in: Ales, especially Pale Ales and English bitters. Excellent, delicate and much admired by brewers, traditional english aroma. Traditionally used in: Lagers and Pilsners – Mild, pleasant, slightly flowery; subtle undertones, perfect for milder flavoured beers. Traditionally used in: Pilsners, Lagers, Bock & Wheat beers. Medium to strong, pleasant hoppy aromas with mild spicy and floral notes. Traditionally used in: Lagers & Bitters Pronounced but pleasant, mainly a bittering hop, distinctive Australian characteristics of pine herbal and spice notes. Traditionally used in: Pilsners and Lagers Pleasant hoppy, earthy slightly spicy, and herbal traditional aroma. Traditionally used in: Ales & Lagers and wheat beers. Mild, pleasant, slightly spicy. The very popular Amarillo hop is now available in Morgan’s 12g sachet’s. 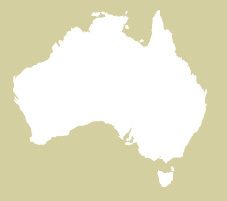 Suited to pale ale and golden ale beer styles, Amarillo delivers floral, tropical and citrus notes. the very popular Centennial is now available in Morgan’s 12g sachet. Centennial suits Pale Ale and IPA beer styles and delivers Citrus and Floral notes. 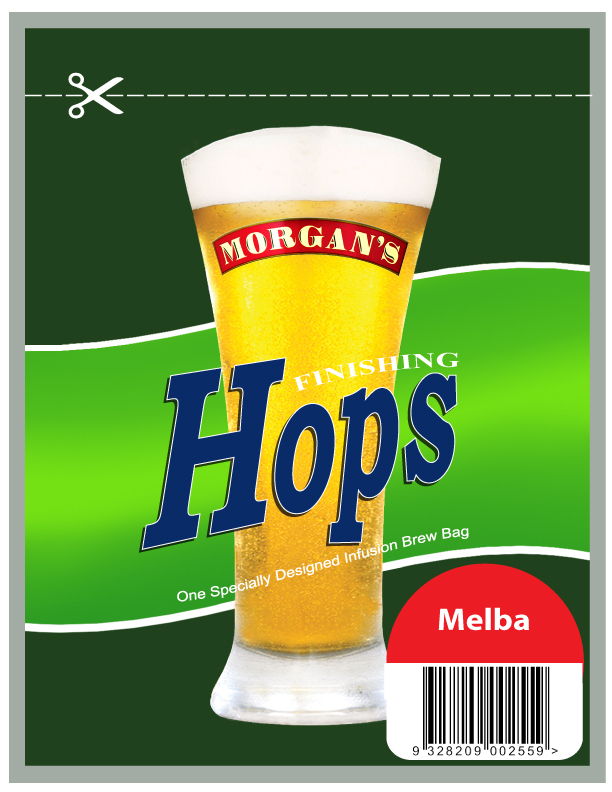 Melba is now available in a Morgan’s 12g sachet. 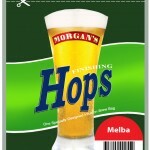 Melba suits Pale Ale beer styles and delivers Tropical and passionfruit notes. Moteuka is now available in a Morgan’s 12g sachet. Suited to European Ale beer styles. Moteuka delivers lemon and lime characterisics. 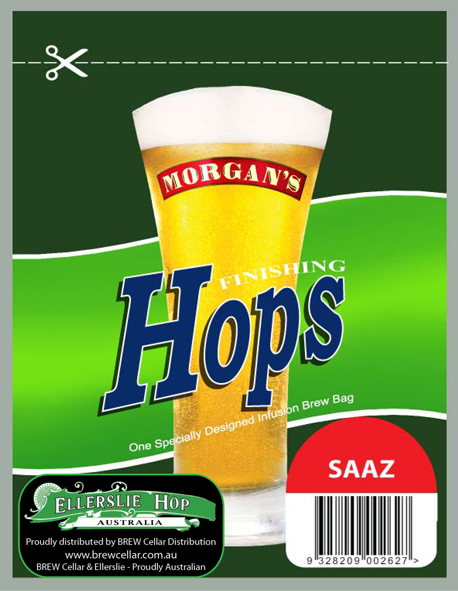 Mosaic is now available in a Morgan’s 12g sachet. Mosaic is suited to Pale Ale and IPA beer styles and delivers Tropical, citrus, herbal and pine notes. Mandarina Bavaria is now available in a Morgan’s 12g sachet. Mandarina Bavaria is suited to Belgian Ale and Saison beer styles and delivers Tangerine and citrus notes. Chinook is now available in a Morgan’s 12g sachet. Chinook is suited to Pale Ale and IPA beer styles and delivers grapefruit, spice and pine notes. 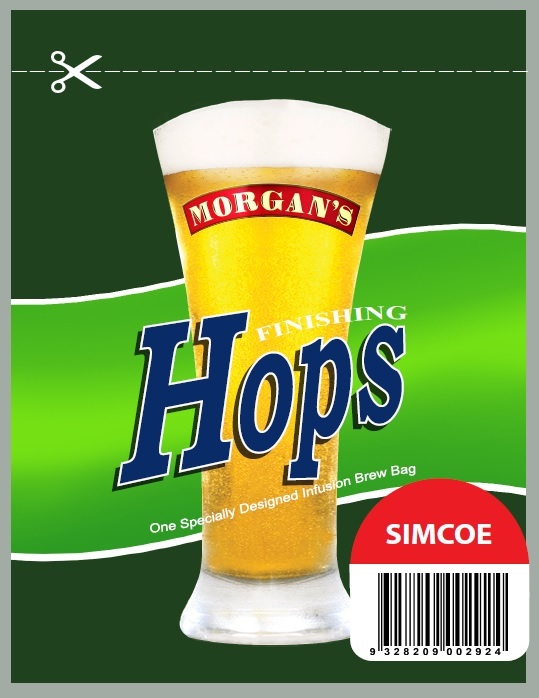 Simcoe is now available in a Morgan’s 12g sachet. Simcoe is suited to Pale Ale and IPA beer styles and delivers earthy with citrus pine notes. 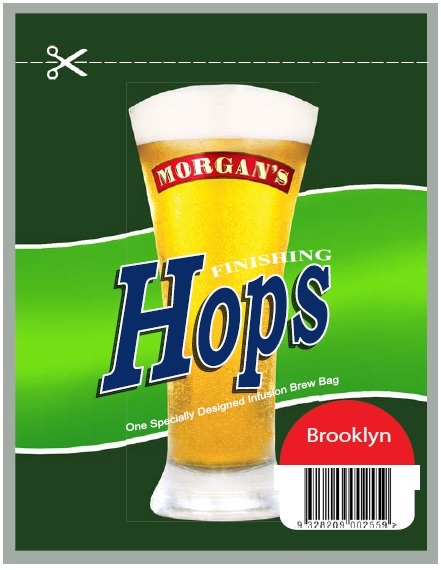 Brooklyn (Moutere) is now available in a Morgan’s 12g sachet. Brooklyn is suited to IPA and double IPA beer styles and delivers grapefruit and passionfruit notes. Nelson Sauvin is now available in a Morgan’s 12g sachet. Nelson Sauvin is suited to pale ale and IPA beer styles and delivers fruity white wine notes. FORTNIGHT is now available in a Morgan’s 12g sachet. FORTNIGHT is a dual- purpose hop blended from at least 5 classic US hop varieties and is suitable for most US styles from pale ales to quad IPA’s. Producing a strong grapefruit character in the foreground with subtle undertones of pineapple and apricot. 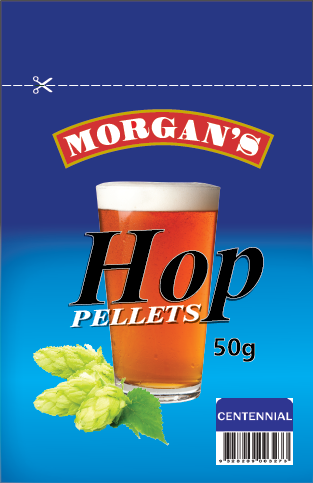 In conjunction with Australia premium Hop suppliers Morgan’s bring you a popular selection of hop pellets packed into the handy 50g pouch. You choose weather to use them as Aroma or bittering . With Morgan’s 50g hops you can add a unique hop flavour and aroma creating your very own boutique beer. Not sure which Hop to use, check out our Hop Quick Reference Table. The popular Hop Amarillo hop is now available in Morgan’s 50g pouch. Suited to pale ale and golden ale beer styles, Amarillo delivers floral, tropical and citrus notes. Centennial suits Pale Ale and IPA beer styles and delivers Citrus and Floral notes. Chinook is suited to Pale Ale and IPA beer styles and delivers grapefruit, spice and pine notes. The hop of the moment Citra, suits Pale ale and IPA beer styles and delivers strong citrus and tropical notes. Suited to Pale ales and IPA beer styles, Galaxy delivers passionfruit and citrus aromas. Mosaic is suited to Pale Ale and IPA beer styles and delivers Tropical, citrus, herbal and pine notes. Simcoe is suited to Pale Ale and IPA beer styles and delivers earthy with citrus pine notes. Warrior is suited to Pale Ale and IPA beer styles and delivers pine and herbal notes. Do you find Hops confusing? Not sure which Hop to use? Check out the Morgans Finishing Hop table for guidance by Hop variety, beer style and character.